There are many musicians looking for more ways to monetize their careers. And yet, a surprising number of them aren’t selling any merch. Sure, merch requires an upfront investment, but it’s not that hard to make money back on it. Truthfully, it’s low-hanging fruit. With Merch Cat, you can easily keep track of sales and encourage more of your fans to buy online. 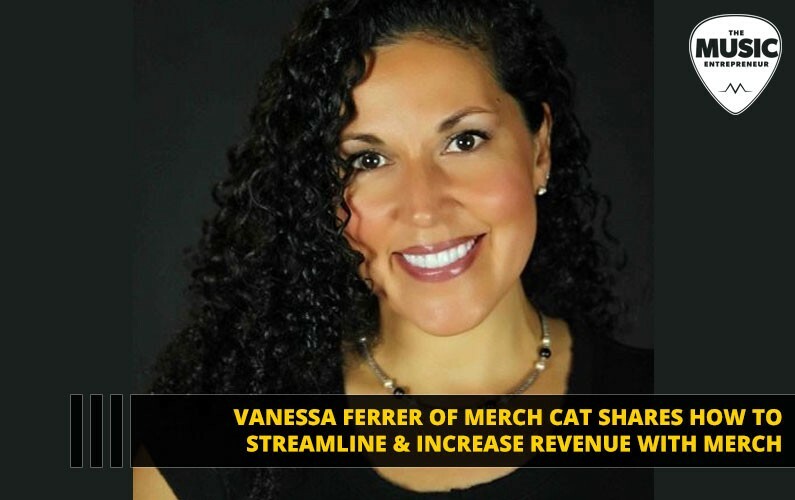 Here’s Vanessa Ferrer, Founder and CEO of Merch Cat to talk more about what’s possible with Merch Cat. My name is Vanessa Ferrer and I’m the Founder and CEO of Merch Cat. Before founding Merch Cat, I had a 15+ year career in accounting and finance. I had always been passionate about music, but never really knew what to do with it. One winter, I was skiing in Vermont and met a guy whose band had just been signed to a NYC Indie label. We kept in touch and when the record was released, and I took an interest in helping them. I watched that band ultimately implode, and I believe a large part of it was rooted in the fact that there was no core person focused on the band’s best interest. That was when the lightbulb went off for me as to how I could combine my years of biz experience with music and put it to use helping artists. 2. What is Merch Cat? How does it benefit artists? Merch Cat is a musician friendly iOS app and web platform that helps artists sell and manage their merchandise at live shows. It’s a point of sale system powered by Square or PayPal, with real-time inventory and sales tracking and show analytics. It allows artists to accept cards or cash, tells them what their sales are, what’s being sold at each show, what inventory is sold and what inventory is left. It helps artists streamline their merch business, stay organized and gives them the data to help them understand what their fans are buying or not buying, when inventory is running low, and what is going on in their merch business overall. We also recently released Merch Cat FAN, a connected direct to fan app that allows fans to buy merch directly from artists in their own app. We did this to help artists expand their reach stemming from the live show to the fans who don’t want to wait on the merch line, don’t want to carry merch around, want to buy merch ahead of time, and those who couldn’t make it to the show. Fans can buy merch anytime/anywhere, ship to home or pick up at the merch table. They can share the merch that they purchased with their contacts and on social. We collect fan emails, and provide a shipping label to the artist. Inventory and sales from FAN are tracked in one place along with their Merch Cat sales. 3. How can artists make the most of their merch and increase opportunities? The name of the game is to always have something for fans to buy, and to have the styles and sizes that they want. Any artist who is not paying attention to these factors is leaving money on the merch table. It’s imperative to have merch on hand with you AT shows and live events where 80% or more of merch sales occur. Telling fans to go buy it on your web store will likely be ineffective because merch is an impulse purchase and fans want a keepsake to keep as a reminder of the event. A webstore should be used as a supplement to the live show and fans should be directed there when there are no shows or tour. Artists need to make and sell items that people would want to use and wear. Start small and basic and then when you start to understand who your fans are and what they’re buying, expand from there. When you’re first starting out, consider the practicality of the items you’re making and when in doubt, ask your fans — they are your customer. 4. What are most artists missing when it comes to revenue streams? Well from what I’ve seen, especially lately, there are too many empty merch tables at shows. Artists who have shows where fans show up should never be without merch. This is the prime opportunity for capturing merch sales and there is no other facet of music where an artist can invest $5, sell for $20 and put $15 directly and immediately into their pockets or bank accounts. 5. How can artists improve their marketing and fan engagement? Good marketing begins with having a good brand to work with, so artists should make a point to invest a little time and thought into their branding, and then have that brand reflected consistently across all of their marketing channels. This is their name, voice, vibe, logo and art, essentially the “face” that they show the world that a fan will look to connect to. Offer limited edition items and exclusives. Use merch as rewards for contests, calls to action and crowdfunding campaigns. Invite fans to contribute to the next merch run by voting on products and designs, or ask them to submit artwork. Incentivize fans to be brand ambassadors by sharing merch on social and reward them with giveaways like a show ticket or additional merch. Run specials at the merch table at shows like bundled items, buy one get one 50% off, first 10 fans to the merch table get a free sticker or other item, etc. Yes — how much is Merch Cat and how can artists sign up? Artists can sign up for Merch Cat at https://www.merchcat.com and download the app on the iTunes App Store. The platform is just $7.99/month or $84.99 a year for unlimited sales. Merch Cat FAN is a free app on the iTunes App Store. It doesn’t cost anything additional for artists to use the FAN feature, and we take a small commission of 7% of sales. Bottom line — don’t miss out on merch sales! And, if you have any other questions or thoughts, leave them in the comments section below. Originally published at www.musicentrepreneurhq.com on December 11, 2018.